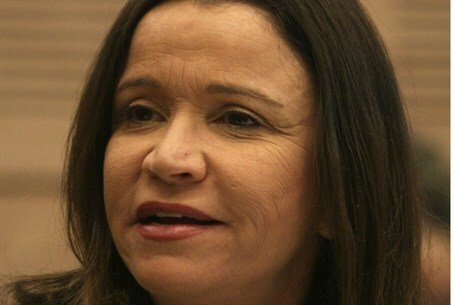 Labor leader says Netanyahu's hubris will cost him the nation's leadership. Labor party leader MK Shelly Yechimovich has declared that she sees herself as a candidate for prime minister in the next elections. "The choice of Mofaz in Kadima has strengthened Labor under my leadership as the most meaningful alternative for replacing Netanyahu," she announced in a statement released Friday. She continued: "I am not aware of a finger of G-d that anointed him King of Israel, and his arrogance, his euphoria, and the sin of hubris – will cost him dearly. He is a politician. Politics has become unpredictable and tempestuous here. I will run against him for the prime ministership, and we have the greatest chance of winning in the difficult and important struggle for the character of the country." "The great confrontation is over leadership of the country. That is where Netanyahu awaits us: the man in whose era the gaps in the country grew to frightening proportions, an extreme capitalist, who systematically crushes the middle class in Israel." "Only the Labor party under my stewardship provides a true and deep ideological alternative, and the tools, the power, the support and the ability to topple him." 'Netanyahu's arrogance, the euphoria, and the sin of hubris will cost him dearly in our tempestuous politics," she predicted. Yechimovich grew up in a militant communist family and was a reporter for the now defunct radical leftist Al HaMishmar newspaper before joining the Voice of Israel government operated radio. As a news editor and presenter at the Voice of Israel, she was instrumental in bouying the pacifist "Four Mothers" press campaign that led to Israel's hurried withdrawal from Lebanon in 2000. She is divorced, a mother of two and one of Israel's most prominent militant feminists.